The Heritage Action Plan, Heritage Register and guidelines for heritage buildings are in the midst of being updated. A temporary guideline called the Heritage or Character Buildings Review - Interim Procedure is currently being utilized as changes to the guidelines are underway and are pending completion for December 2015. This interim procedure applies to development applications involving pre-1940s buildings and reflects policies that aim to "enhance the retention and rehabilitation of character homes throughout Vancouver and reduce construction waste". By providing incentives rather than penalties, the City encourages owners to retain pre-1940 buildings. Plans to demolish a heritage or character building in Vancouver must be done through a demolition application with particular criteria from the Interim Procedure in which there are varying criteria across the city. What is a Character Building? - other period features (porch, roof, foundation). Thus, property owners retaining the original buildings in the RT-3, RT-7/8, RT-10, RT-11 and RM-1 Zones are eligible for incentives including increase density and height. The breakdown of the zoning area is found below. For a complete zoning map of Vancouver, click here. The interim procedure applies to the aforementioned zoning areas including RS-3 and RS-5 as well as where conditional zoning provisions apply. 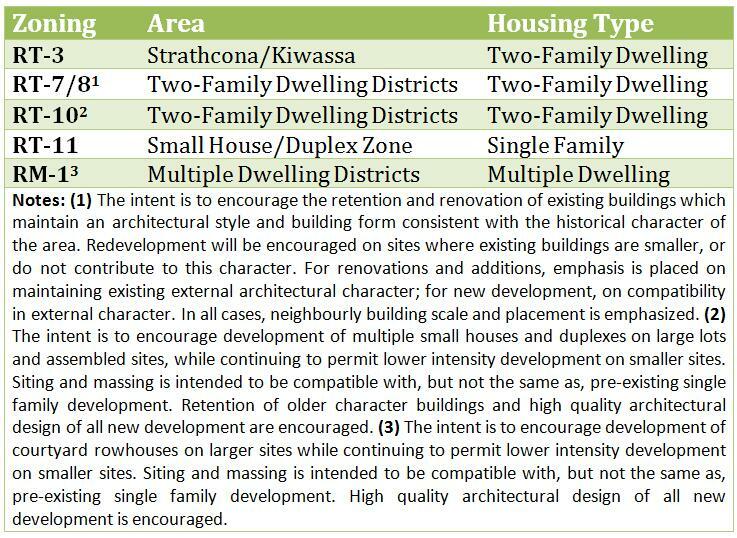 Conditional zoning areas represent ~23% of one- and two-family zoning areas located in Arbutus, Dunbar and Kerrisdale. Stay tuned on Part II of the series "Heritage Action Plan Revision".